This past Saturday, Columbus Drama competed in Individual Event competition for our district. 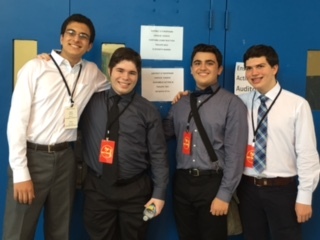 Against 50 other schools and thousands of other students, Giovanni Aprigliano, Juan Suarez, Daniel Sanchez, and Justin Rodriguez received the prestigious Critic’s Choice Award (the grand prize) for their ensemble piece! We have the second half of our competition on December 5th and will receive the rest of the results then, but for now, those four are states bound!